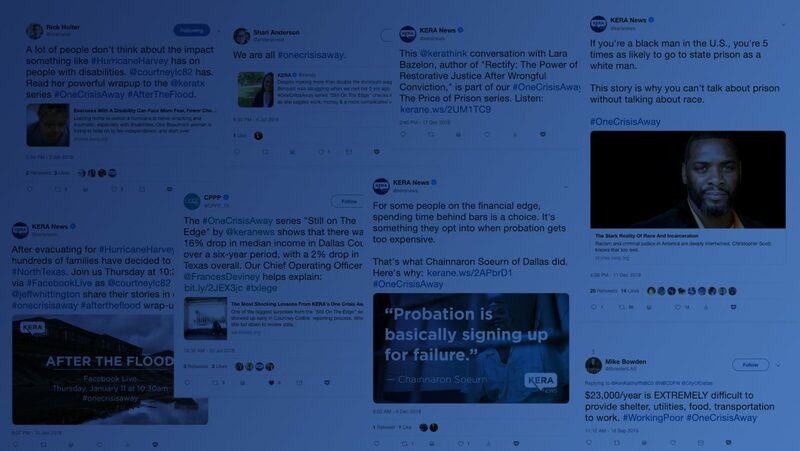 We at KERA tell the human stories of asset poverty and financial struggle in North Texas through our ongoing One Crisis Away project, which is supported by our 5-year-old #OneCrisisAway timeline on Twitter. It ties together promotion of our journalism with personal thoughts shared by newsroom and community members. In 2018, the #OneCrisisAway timeline mostly centered around the award-winning stories told in three of our OCA series: the Price of Prison, Still on the Edge and After the Flood.